The first item I want to introduce you to is a brand called Masker Aide. 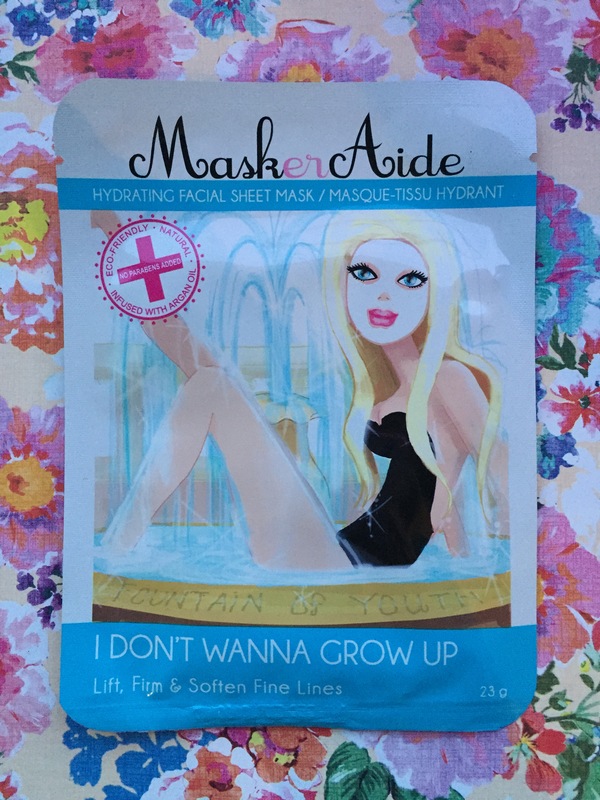 They have a range of hydrating facial sheet masks which are tailored to combat anti aging, fatigue, dullness whilst exfoliating and just general skin pick me ups from the change in weather conditions, excessive air con usage and stressful days. This mask in particular is an intensive multi action mask which prevents the signs of aging whilst nourishing the skin. It provides deep hydration and delivers a healthy dose of age defying ingredients such as Ylang Ylang Oil, Argan Oil, Vitamin E, Collagen and Elastin which all help to diminish fine lines and bring out a youthful glow. It’s a fabric sheet mask which is loaded with a serum formula. I leave the masks in the fridge for an extra oomph when applied to the skin. After 10 mins, my skin looks refreshed and glowing. I use the mask once however there is enough product in the pack to apply directly to the skin for 4 days after, so definitely value for money. I always find that if I have any dry skin, after one use I wake up in the morning with perfect skin! These are seriously a miracle product and I am officially addicted! I have been searching for a water bottle that contains a straw for sooooo long and finally Pink have came to the rescue! It is perfect for on the go and for ensuring that you are fully hydrated and consuming enough water daily. Although this bottle retails at £14, I actually got it for free!! 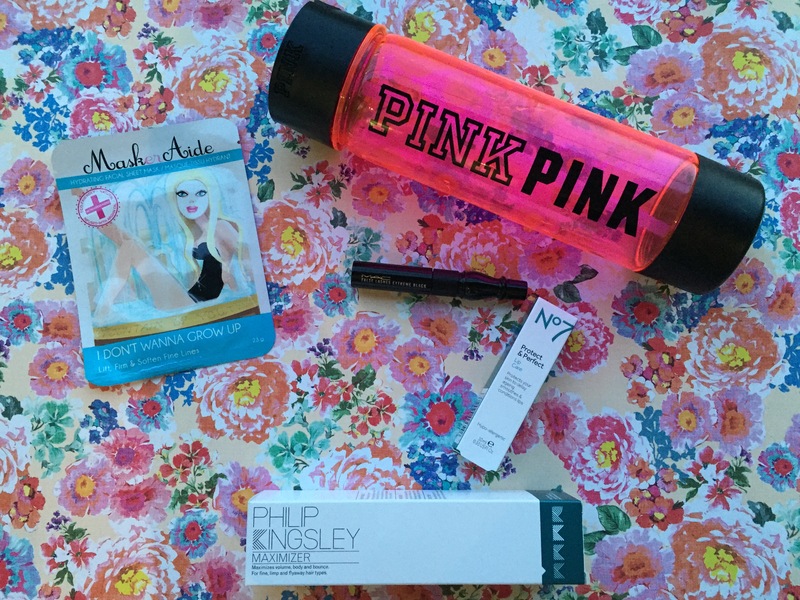 (: I will be including it into my Pink haul which will be up shortly. Basically if you spent over £100 in Pink, you got a water bottle and sports bag for free. Bargain! Plus you could choose from a variety of colours but clearly Pink is the winner. 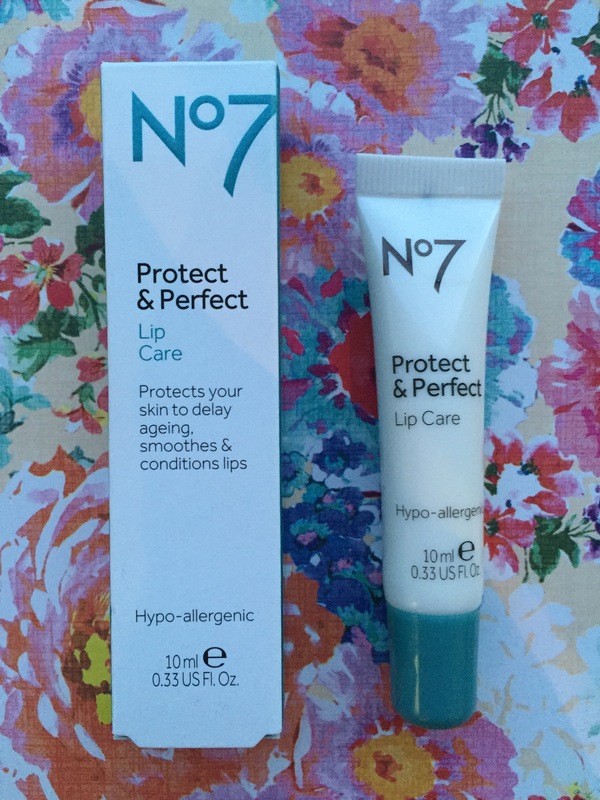 When Boots do their awesome £5/£3 off No 7 products, I always like to try out some of their other products as they can be rather expensive. This lip cream smells amazing! It’s a very sweet vanilla fragrance but not too over powering. It’s a white cream which is packed with nourishing ingredients to keep your lips soft and smooth. From the first application you notice a difference. It’s also small enough to carry with you at all times. I swear by this product! 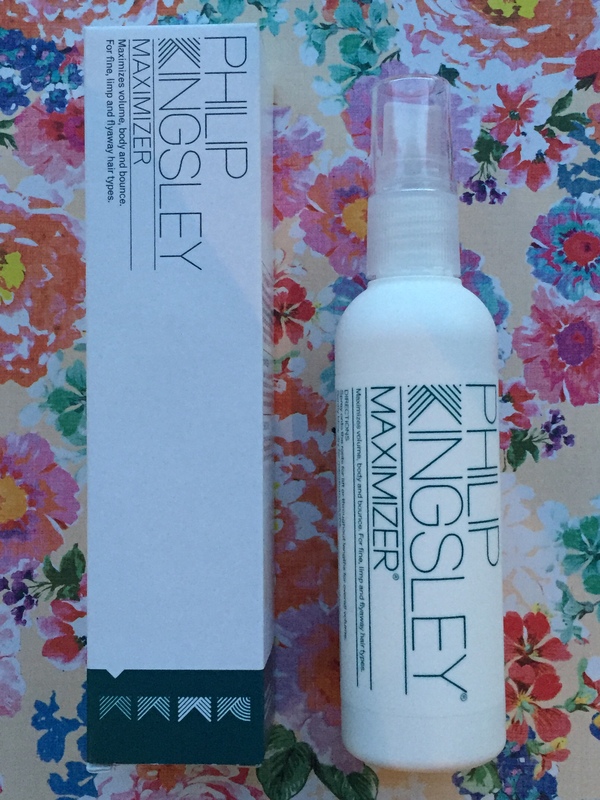 This is a spray hair thickener for fine, limp fly away hair. You don’t need to use a lot and it doesn’t leave hair feeling greasy, sticky or overloaded with product like most other hair thickeners. The other bonus is that it doesn’t make hair static. Spray it onto towel dried hair, then blow dry hair as normal. I always find that when I’ve used this product my hair stays looking great all day long and doesn’t fall flat half way through the day. It’s kind to hair and is perfect if you have fine hair. First of all, if you head to the pay point in MAC you will find their miniature collection ranging from mascaras to eye shadow pots. Perfect for travelling or simply to sample without the hefty price tag. 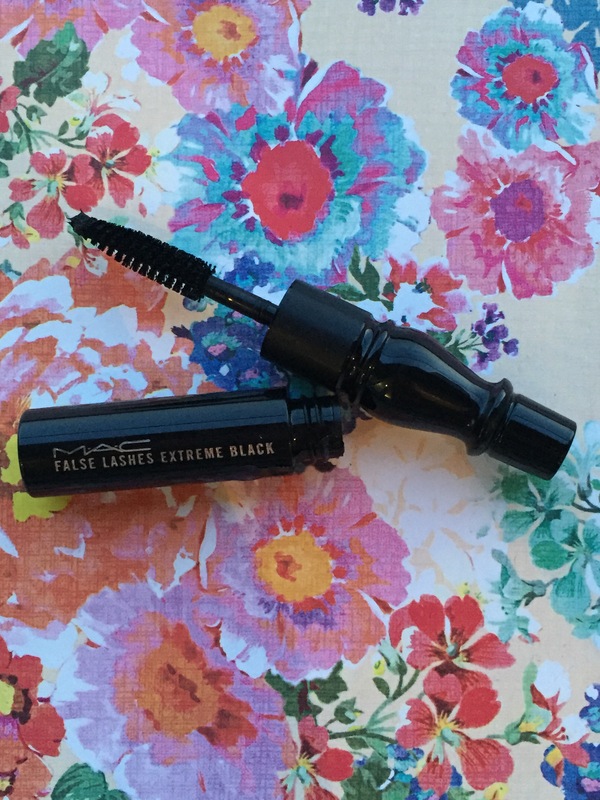 This mascara is brilliant! My lashes are very full anyway however when using this, people are always convinced that I’m wearing false lashes! It’s super easy to apply and can be built up to create a glamorous yet dramatic effect. It’s very black which gives a great finish. Love it! I’m actually going to do a mascara review shortly so will include photos of how they look on the lashes then. So there you have it. These were the products that I was loving during August. Let me know your thoughts on whether you have tried out these items and of course, I would love to know what items you were loving in August. Please leave comments in the box below. 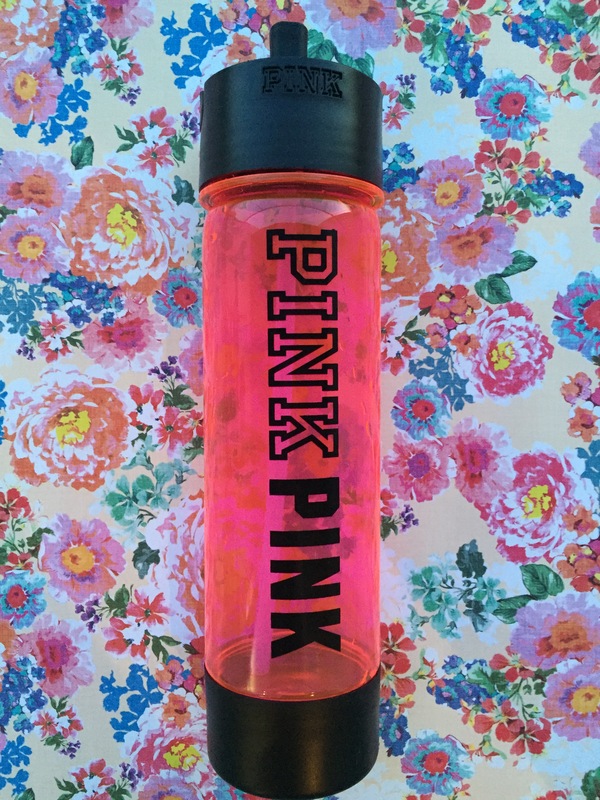 LOVE pink water bottles; I have a few and no other water bottle(s) compares to their cute packaging and brilliant colors. Hopefully, you get through whatever it is happening in your personal life pronto ❤ Happy September lovely!